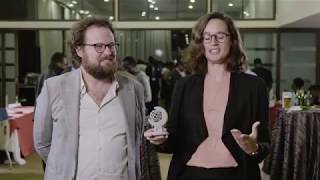 SimGas, a sustainable enterprise from The Netherlands and Kenya, has won the prestigious international “2018 Climate & Clean Air Award”, hosted by the UNEP. James Shaw, the New Zealand minister of climate change presented the ceremony yesterday at the San Francisco Museum of Art. SimGas won in the “innovative technology” category for their revolutionary, high-quality and affordable biogas systems, which have tremendous positive impact on climate and the health of thousands of farmers in Kenya and Tanzania. One biogas system reduces 8 tonnes of CO2 per farmer per year - the equivalent of a person’s 8 return flights from Amsterdam to New York City. Winners in the other categories are: The Leonardo DiCaprio Foundation, Nobel prize winner Mario Molina, Santiago de Chile (Chile), Pune (India) and China. Dairy farmers can use the systems from SimGas to generate their own cooking gas and bio-fertilizer by simply filling the system with cow manure. Important to mention is that the systems are affordable for dairy farmers: the biogas systems are cheaper than cooking on charcoal. While clean cooking systems are not new, SimGas has developed and is selling a truly disruptive technology. The systems are manufactured using plastics, and can be transported to remote rural areas more cheaply than traditional masonry-based systems. Construction times are also significantly faster than traditional designs. With this highly scalable technology and distribution model, SimGas hopes to reach tens of thousands of households in East Africa by 2022 further contributing to the reduction of short-lived climate pollutants. SimGas was founded in 2009 by brothers Sanne and Mirik Castro. Since then the company has grown to 70 people in Kenya and 10 in The Netherlands. Today more than 2,500 dairy farmers in Kenya and Tanzania make use of SimGas biogas systems. Becoming profitable is a challenge for SimGas. Running a business in renewable energy technology is already a big challenge on its own, let alone doing that in the often challenging environment of emerging markets. SimGas has overcome many setbacks in past few years. To reach scale at which they can be profitable, SimGas is now seeking additional financing and are actively looking for interested investors. Worldwide, about 3 billion people use solid fuel such as wood or charcoal for cooking. The smoke from this fuel causes indoor air pollution, leading to the premature deaths of approximately 4 million people annually. SimGas is working to change this by improving the lives of 10 million people with its domestic biogas products by 2030. For their efforts, SimGas was awarded a 2018 Climate and Clean Air Award for Innovation. East Africa, where dairy farming is the main occupation of rural households, has the world's highest percentage of people using solid fuel for cooking. Rural households have no alternative as less than 4 to 8% have access to electricity. The SimGas program has led to the installation of 2,500 biogas systems with stoves in households throughout rural Kenya and Tanzania. These systems reduce short-lived climate pollutants in homes and adjacent kitchens, and also decrease indoor air pollution - a leading cause of skin, eye, and lung diseases. SimGas biogas digesters also decrease pressures on forest resources by lowering demand for wood and charcoal used as cooking fuels. The Climate and Clean Air Awards recognize exceptional actions that produce results for the climate, air quality and sustainable development. The award is global in scope and the nominees cover a wide range of activities and actions from individual efforts to transform a polluting sector, to national policy that is transforming attitudes, sparking innovation, and providing business opportunities. The Climate and Clean Air Coalition Secretariat is hosted by the United Nations Environment Programme. The Climate and Clean Air Coalition is a voluntary partnership of governments, intergovernmental organizations, businesses, scientific institutions and civil society organizations committed to protecting the climate and improving air quality through actions to reduce short-lived climate pollutants – black carbon, methane, hydrofluorocarbons and tropospheric ozone. The Coalition supports the achievement of transformative actions, policies and regulations that lead to substantial reductions of emissions. These actions can directly prevent up to 2.4 million annual premature deaths and help avoid up to half a degree Celsius of additional warming by 2050. Reducing short-lived climate pollutants must complement deep and persistent cuts to carbon dioxide if the world is to limit global warming to 1.5 degrees Celsius.